Live Web Chat Software is smart and cost effective tool to provide superior customer support service in real time. Online chat software helps your online customers and web site visitors to interact with your support team for live assistance through live chat system in easiest way. Software provides interaction between online customers and support executives and technical agent of any website organization or firm through chat conversation. Live chat software reduces service time, costs and increases customer satisfaction with easy to use web based chat. Customer supported web chat tool provides help to manage your real-time online business such as travel, real estate, auto sales, web hosting, education, insurance, finance, web designing etc. Real time chat software provides cost effective means to talk with customers all over the world instead of making expensive telephone call or sending e-mail for any query solution. Web chat utility is fully capable to receive offline messages when the customer support operator is not online or is unavailable. Live Chat Software provides superior customer support services (24 hours a day 7 days a week). Online chat software facilitates viewing IP address and host name of each website person when logged in the chat session. Facilitate operators to see the text typed by customer before they send it. Operators can send live chat sessions to visitors at their specified email address for future assistance. 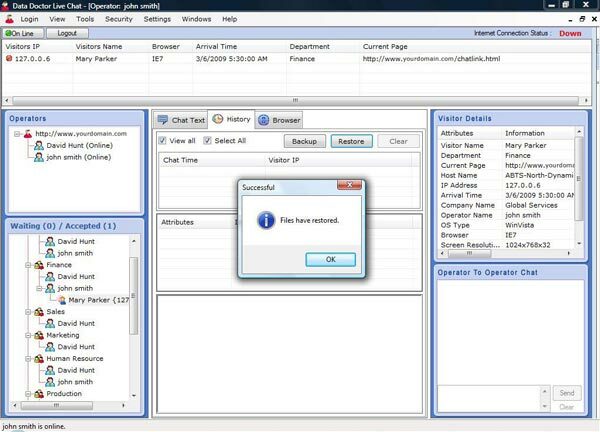 Website chat software allows website administrator to change Login/password of the web chat utility. Provides full text chat history details along with time, date and visitor’s information. Allows operators to interact between the chat sessions to increase the software flexibility. Operators can use canned messages (saved messages) to send instant response to visitor. Facilitates to transfer chat between operators in between the conversation currently taking place. Allows operators to easily push web url’s in order to provide instant customer service. Enable you to see the IP address and host name of each visitor and block mischief visitors from entering chat session. Facilitates visitors to send offline messages if operator is not available online. Software supports all major web browsers including Internet explorer and other major web browsers.